The cost of not maintaining trees results in a loss in net benefits from urban trees. But there are many tree benefits in society. And these will emerge without management of the trees. However there will indirect costs and poor services as a result such as tree failures, tree debris, branches over roads and conflicts with the urban landscape. A client today who had previously complained to his district authority about one of their overhanging trees that in the recent high failed. 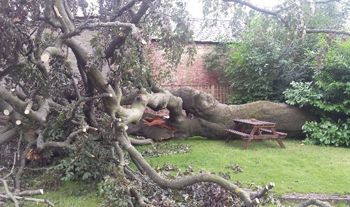 The damage was fences, lawn and conservatory somewhere in the region of £2000.00.The cost to manage this tree probably wouldhave been somewhat less. Maintaining trees may vary between: nutrient feeding and watering of the trees to aid health and vitality; formative pruning at an immature age to ensure a good future crown shape; structural pruning of young trees to correct faults; regular inspection of trees for hazards and monitoring the responsive growth of mature trees to pruning. The regular surveys of trees for hazards combined with monitoring responsive growth will help determine the level of tree maintenance and aid a decision over the cost benefit of retaining a tree. New tree establishment is linked to water availability. Without sufficient water tree health with suffer and lead to death. It is less expensive to water trees than to replace them. Management of variable tree pest and diseases is ongoing. This currently features around ash dieback, oak processionary moth, Massaria of London plane trees and bleeding horse chestnut trees. Generally treating trees and the prevention of tree death is cost effective. Always the removal of unsafe trees is essential but this should be followed by replanting. Pruning mature trees on a four to five year cycle is the optimal time frame. Delayed pruning causes the condition of the tree to decrease combined with an increased costing in time pruning and increased costs in tree waste. Allowing trees to age also has to be considered with the increased cost of maintenance versus the ecological considerations but should be carefully considered. Overall the cost of not allocating resources for maintenance of trees when performing maintenance on trees would have gained net benefits is an opportunity cost. Please call or email we would welcome your enquiry and we can guide you on the process of tree management. When it comes to your lawn or garden, the professionals at Ace of Spades, the Norfolk Norwich Tree Care and Landscaping Company provides you with the right care for your needs. They provide the best in landscaping, lawn care, tree maintenance, gardening services and the like for your property. This is especially true when it comes to treeworks that focus on the health and wellbeing of the trees on your lawn. Trees are certainly beautiful and play an important role in the health and wellbeing of the property. However, just like any living form they may be in need of proper maintenance to ensure that they stay healthy for a long time to come. Proper Tree Assessment Norwich Residents can Trust. Unfortunately, too many people do not think much about their trees until they either fall down or large limbs break off and start landing in the yard or worse, on their vehicles or even their home. More often than naught, there are indications that something was wrong with the tree long before it started to fall apart. This is particular true during a storm which actually tends to break apart trees that were already sick or in danger of falling apart over time. Most healthy trees will survive a strong, windy storm with little more than a few twigs breaking off. It is the unhealthy trees that tend to fall apart in larger chunks. Our services start with the type of tree assessment Norwich professionals have been using for many years when it comes to looking at each tree on your property. A proper evaluation as performed by our company starts simply by looking at the tree to see if there are any indications of damage or rot that threatens its health. Whether your tree has issues that need to be addressed or simply needs to be pruned for better health, we can provide the services at a low, competitive rate. We are the arboriculture specialists that understand what is required to keep your trees healthy for as long as possible. Trimming and Pruning: Our services include pruning and trimming the tree so that branches do not become a danger to you or your property in case of a storm. We are the arborist Norwich residents call when they need their trees regularly maintenance. Our services help ensure maximum safety that helps prevent branches from breaking away during storms or other incidents that’s places you in danger. Tree Surgery Norwich Specialists: If your tree is in need of treatment, we are qualified to provide the services needed in order to help the tree overcome any particular issues that it may be facing. On some occasions, it may be that the tree needs to come down entirely because it is too injured or ill to survive. If that occurs, we have the equipment and expertise necessary to do the job right. At Ace of Spades, the Norfolk Norwich Tree Care and Landscaping Company, we provide you with the proper services that provide the best in tree maintenance for health and beauty of your lawn. When it comes to the trees on your residential or commercial property, providing proper care and maintenance will not only protect the health of trees, but will also improve the overall appearance of your lawn as well. At Ace of Spades, the Norfolk Norwich Tree Care and Landscaping Company, we offer the right treeworks for your needs. We are the arborist Norwich residents call when it comes to taking the proper care of their trees. One of the simplest, yet most overlooked methods of taking care of your trees is the proper pruning of branches which can add considerably to the health of the trees over time. Proper tree pruning Norwich residents and business owners can expect comes from our expert services that have been developed over the years. There are many different benefits that can be derived from having your trees regularly pruned. The beneficial services of inspecting and pruning a tree may add years to its life and might prevent a disease or rot from settling into the tree which may cause extensive damage. Aesthetic Beauty: The look of a properly pruned tree is certainly something to behold. So, it’s little wonder that just on the aesthetic level having a tree that appears balanced will improve the overall appearance of your lawn. Plus, being it good health will also add to the lookand even the value of your property. Inspection: As part of the pruning process, the arborist inspects the tree for any signs of disease, rot or damage that will need to be addressed. The sooner such damage is spotted, the easier it will be to properly treat. In some cases, if the affected area is limited to a branch, then it may be cut away with the proper pruning technique. Weight: One of the biggest advantages of proper pruning is something that many people may not consider until a heavy branch comes down in a storm. By trimming away the excessive length of branches, they become more secure to the tree itself because the weight has been reduced. While good, strong branches will hold up over time, when they carry too much w eight they present a danger that must be addressed with pruning. At Ace of Spades, the Norfolk Norwich Tree Care and Landscaping Company, you can schedule the proper tree pruning services that will help keep your trees in top flight condition. They are also the tree surgery Norwich experts that can spot issues with your trees quickly so that you can be informed about their condition. If you are concerned about the overall health and appearance of the trees on your property, then call or contact the tree maintenance specialists that will work for you to ensure that they receive the care they deserve. Proper tree pruning will not only have your trees looking better, it can take away branches that may present a danger to you, your family property as well. So, call today and see what Ace of Spades can do for you. Great landscapes come from vision, teamwork, client cooperation and understanding the many layers to create great results. We work closely with clients understanding their requirements and identifying the time line of what time to do what when. The project below has just been completed in Norwich. Overall this was in the region of £60,000 to £70,000.The scheme started out with a client claiming they had a problem with an uneven existing working garden. 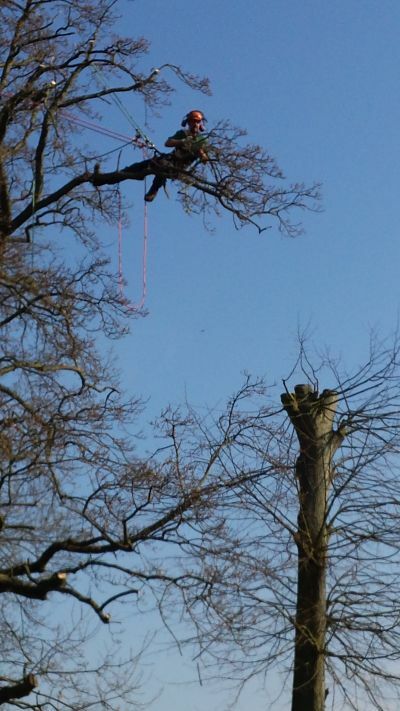 The first stage was tree works, following a tree survey and application to the local authority several dangerous or diseased trees were taken down, some were braced and others pruned. Then a scheme was hatched liaising with the requirements of the client. This shows a concept plan.The idea was to contruct a sustainable kitchen garden.This comprised of raised beds based on a parterre style,green house,fruit cages,brassica beds,compost units,log store and a bespoke larch lap shed , seating areas and an eneterance area give sence of quality.Breedon gravel was used as a surfacing. Larch lap shed with work areas. View from beds to fruit cages and tree planting. Shed and greenhouse with seating area. When we work in the landscape we believe in creative long term solutions based on our client’s requirements. Homeowners in Norwich Norfolk UK love their gardens. Gardening can be considered nothing short of an art form with many gardeners spending countless hours creating the perfect garden for themselves. However, keeping that garden looking great is another task altogether. The UK has a variety of animals that you may not want visiting your garden. This is why it's important to install garden fencing whenever necessary to protect your garden. So, would you know who to turn to to get a high quality garden fence installed? Look no further than Ace Of Spades Landscape Services for all of your garden fencing needs. Ace of Spades Gardens Service is a professional lawn and gardening service that specialises in everything from lawns to planting. This company not only knows how to create and maintain a perfect garden but also install fences, hedges and boundaries that are catered to customers needs. Additionally, The Ace Of Spades landscape service knows all the UK rules and regulations when it comes to landscaping and gardening. You can rest assured this professional landscape service will provide nothing but the best if you use our services. For a free quotation and expert advice contact us at info@aceofspadesgardens or telephone 01603 487447.